Calista Moon and John Updike, 1981. In the background is the helicopter that had crashed while taking them to the top of Auyantepui in Venezuela. Photograph by Bart Moon, courtesy of UNC's American Diplomacy website. We took dozens of heroic-survivor photos [and] peered nervously over the edges of this new world. . . . Meanwhile, John, the essence of cool, was busy indulging a surprising passion for botany. . . . At the same time Martha and [Bart's wife] Calista had wandered off on an exploratory walk of their own. This was worrisome because the mist that would engulf us from time to time was so dense that one could hardly see one step ahead. Because we were situated close to the rim of our island in the sky, one misstep and our party of eleven would be ten. Living through two crashes in a single day didn’t slow down Updike a bit. In 1981 he saw Rabbit Is Rich through to publication; it spent twenty-three weeks on the New York Times Best Sellers list and would become the first (and still the only) novel to win the American literary trifecta: the Pulitzer Prize, the National Book Critics Circle Award, and the National Book Award (then known as the American Book Award). He also completed the interconnected stories that would be collected as Bech Is Back and finished several new short works (the first of which, “The Lovely Troubled Daughters of Our Old Crowd,” was accepted and published by The New Yorker soon after his return to the States; the second, “Venezuela for Visitors,” was inspired by his trip). “The Lovely Troubled Daughters of Our Old Crowd” describes the grown children who once played together at the peripheries of the buoyant social lives of their young parents. . . . They still haunt their hometown “as if searching for something they missed.” The transgressions the narrator remembers rather nostalgically, seeking to account for the fear he sees in these young women, are not remarkable—suburban cordiality overstepping its limits. He sees their importance for the first time in these inhibited lives. The disproportion between cause and effect, the manners of one generation sealing the fate of the next, set the conventional in a sharp, transforming light. Notes: Among the cultural references in Updike’s story: D.R. (page 118) stands for Design Research, a furniture and housewares retailer in Harvard Square that closed in 1978; Stingers (p. 119) are cocktails composed of three parts brandy, one part crème de menthe; Steiff animals (p. 120) are collectible stuffed animals made in Germany; Stop & Shop (p. 121) is a New England supermarket chain. Why don’t they get married? You see them around town, getting older, little spinsters already, pedalling bicycles to their local jobs or walking up the hill by the rocks with books in their arms. . . . If you don't see the full selection below, click here (PDF) or click here (Google Docs) to read it—free! This was excellent. Updike in Cheever country. These are my thoughts, not just about this particular story. Cheever & Updike sometimes shared a neighborhood, differently. 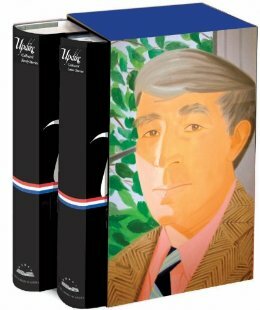 The outsider Cheever aspired, but Updike's enviable luck was to have been raised belonging, even if not where he wanted to be, yet firmly somewhere & not somewhere else, with the result that he was at home in himself in the world wherever he later landed. And so, adding to everything else he had going, he could be generous. His industry is all to his credit, but luck of birth made him great.